Just now I have been peer reviewing a study for the Cochrane Collaboration as part of the Cochrane Airways Groups. It has been fascinating doing this as it is the first time I am part of something from the early stages to now where the study has been carried out and dissemination will occur. Im not sure I can say much about the paper at all but this is not the reason for the post. While reading the paper I kept coming up with questions, thoughts, my own opinions and opinions shared by many who suffer from asthma. The paper was broadly about the use of pulse oximeters in asthma. What got me thinking reading this was how often either people will post about how they have low oxygen saturations yet will fail to get and seek medical help or those who have got help but don’t understand the Dr’s lack of urgency when they feel rubbish but have relatively good oxygen saturations. Having had a tricky time with my asthma for a while now I have seen and felt a lot of different oxygen saturations and the effects it can have on your body. About 10 years ago the Sister of the respiratory ward I used to attend took time and explained all about oxygen saturations, asthma and young people. I go by numbers- or at least try to. I find if I can see a number and see that it is ok then I am ok and I can relax a little. If I see a bad number I find it almost makes me worse because I know things are not good. However I learned that in asthma particularly in young people a high oxygen saturation for a prolonged time can be a sign of worse to come. I never realised younger people had a bigger oxygen reserve and could have an asthma attack but maintain good oxygenation for a longer period of time. As good as having a reserve is many nurses will worry. I remember this so well, my nurse was in a little panic. I was quite happy as I was in a side room however had said my chest was feeling tight and the effort of breathing getting harder but I knew my jobs were ok as just had them done. I thought I would have a nebuliser and hat would be that. I was shocked when the nurse rushed out and got her colleague and they moved me straight away to the high care bay. The reason being the nurse recognised that I was using up my reserve and she was right. It was not long before my oxygen saturations dropped and I was taken to ICU and put on a non invasive ventilator. Thank goodness for her experience and recognising the signs and a bad situation was averted. This is what so many people don’t understand with asthma though and probably why the statistics of hospital admissions for exacerbations of asthma and asthma deaths are so bad. Most consultants or GPs will not advocate for their patients to have a portable pulse oximeter at home because by the time oxygen saturations drop in an asthma attack you should be seeking medical help. The first sign of a severe asthma attack is a drop in peak flow but also a slight drop in carbon dioxide level on an ABG. When struggling to breathe your first instinct is to gasp and breathe more causing this initial drop in CO2 but as your airways become tighter and tighter your struggle to get rid of the air you breathe in and your CO2 will start to rise and oxygen will drop. Therefore if you are waiting at home till your oxygen levels drop your taking your life in your hands and risking serious consequences. The other problem with pulse oximeters is that they are highly unreliable and can be effected by so many external factors. When in hospital you will always have your oxygen levels measured with a pulse ox however they will also be confirmed by having an arterial blood gas which will give your true oxygen levels in your blood. An ABG can also tell medical staff about how unwell you are and how hard you are having to work with your breathing. I can totally understand why many people will delay going into hospital despite feeling awful and really struggling to breathe. My feeling is that many Drs and Nurses will take a set of observations and will show the patient the machine and comment that their oxygen levels are good so they are doing ok. They may have good oxygen sats but you can still feel terrible. This comment about having good sats can often make many feel that maybe they shouldn’t be in A and E because the staff have said they are ok. The staff will be saying this to reassure the patient and not suggesting that they shouldn’t be there but it will often feel like that to a patient. This highlights how simple phrases can be taken in so many different ways and different interpretations made from them. I guess the point of this post is that I want to highlight just how bad asthma can get and how not to rely on a pulse oximeter at home and get help once your oxygen levels start dropping. Even if you hate hospital (as practically everyone does) or are fed up going it is better to go often and get a small amount of treatment to regain control of your asthma than wait till your really ill and in grave danger which requires a huge amount of medication and interventions from Drs and Nurses to get you back to feeling well. It would probably turn out that if you add the hours up that you spend going to hospital or a Dr to treat a mild to moderate asthma attack may very well still equal less hours spent in the hospital than you would if you waited till you were really un well. Having said all this I must confess I do have a pulse oximeter of my own at home. A previous consultant gave me one but I now use it to monitor my heart rate which seems to go from anything around 110 to 180 when it feels like. Most of the time I have no idea where my pulse ox is and don’t use it very often at all. If anyone takes anything away from this post it is to get help early for your asthma attacks. Don’t wait until you think a Dr might take you more seriously because your oxygen levels are bad. They would prefer you to come early and get treatment and get home (the cynical side in me would say that this makes Drs lives easier and they don’t need to do so much work this way too!!!). I’ll admit, I definitely hate being told I’m ok because my sats are fine. I’ve been told a lot of times when I feel terrible that I’m ok because sats levels are 94% or more. And it definitely worries me when the staff just then do nothing and I’m left struggling sometimes. I do feel this isn’t well known even by some nurses on respiratory wards, that and the whole “oh you’re not wheezing that’s good” but really it’s a silent chest, or presenting in another way. And when a nurse/doctor does point out that your sats don’t have to drop etc I suddenly feel so safe and know I can trust them to help me. 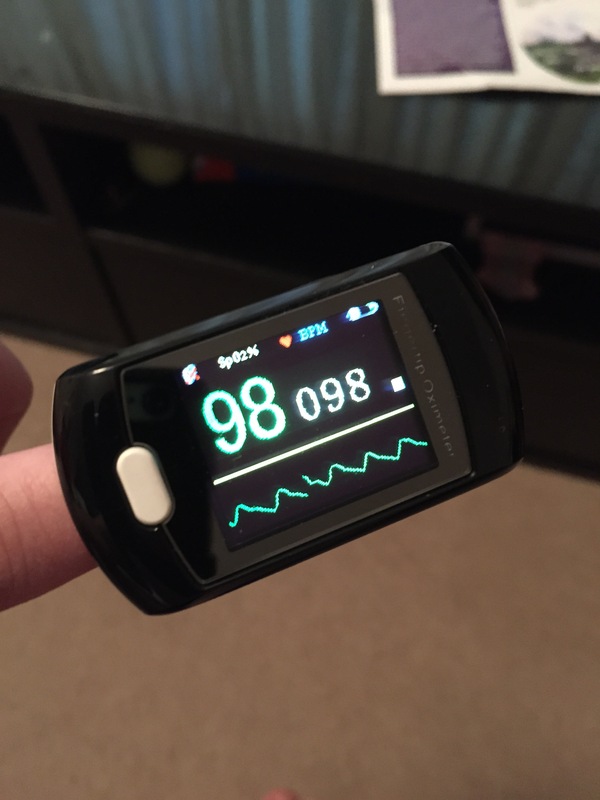 I bought a pulse ox about a year ago when I saw people were using them at home, and like you I pretty much only check my heart rate now, because if my sats have dropped and I’m at home using my own pulse ox, I know I’ve made a big mistake and I’m in trouble! I get annoyed cause on my resp ward they go a lot on sats. If your sats are fine then they think you’re fine. Despite them knowing that I can feel rubbish and end up very poorly with pants gases, they don’t seem to get it.